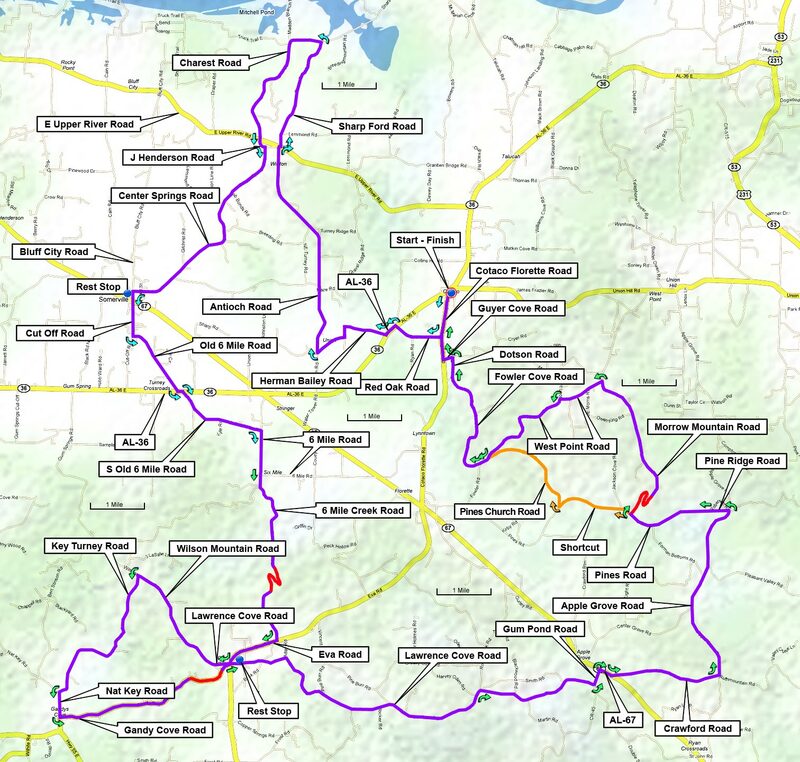 This ride is 63 miles, starting in Cotaco at the intersection of AL-36 and Cotaco-Florette Road, south of the Tennessee River. The route is rolling with long grades. It travels on mostly good pavement thru beautiful quiet farmland, with rest stops at 17, 27 and 37 miles. There is a reversed version of this route that tackles the climbs earlier in the ride. Mile 24: 6 Mile Creek (topo) gains 405' in 0.9 miles for an average grade of 8.5%. This is a shaded climb on a quiet road with a few switchbacks. There are a few hills after the "top." Mile 36: Gandys Cove (topo) gains only 265' in 0.8 miles for an average grade of 6.3%; it's also shaded. 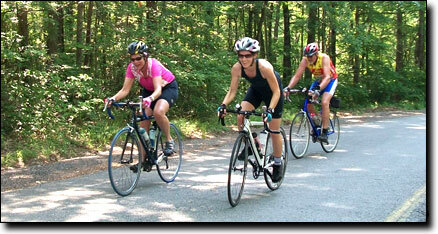 Mile 53: Morrow Mountain (topo) gains 410' in 0.9 miles for an average grade of 8.6%. The grade varies so there are some steep sections and the pavement is rough, but it's lightly traveled and shaded as well. There's a 10 mile loop at the southwest corner of the route, between the second and third rest stops (the same store). The final climb, Morrow Mountain, is the most difficult and comes late in the ride. But it's easy to skip, shortening the ride by 3 miles (directions to skip the climb are on the cue sheet). Legend has it that Cotaco was the name of a Creek Indian chief in the area. The original pronunciation was Cuh-tauk-uh but the locals now pronounce it Co-TAY-co, with all long vowel sounds. The total elevation gain is 2,610', starting at 620' with a maximum elevation of 1,210'. 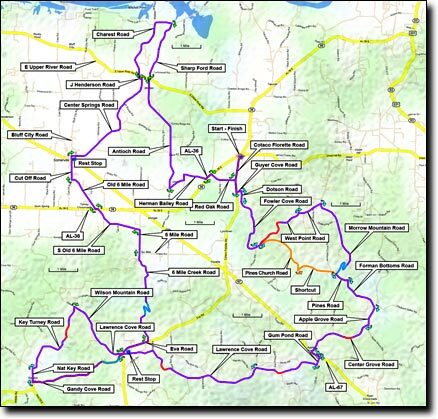 There is a 40 mile version of this ride with no climbs, shown here in blue. The first 22 miles are the same as this ride. 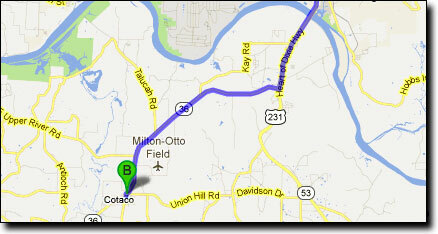 This ride begins at the Cotaco School parking lot, on Cotaco School Road off of AL-36, south of the Tennessee River. Travel South from Huntsville on US-231 (Memorial Parkway) across the Tennessee River. Three miles after the bridge turn Right on AL-36 (flashing yellow light). Travel 8.3 miles to the intersection with Cotaco School Road and Cotaco-Florette Road, at the Cotaco Grocery store. Turn Right and go 0.2 miles to the parking lot in front of the school. Google Maps driving directions to Cotaco School.